The author of the book, Sheila Burnford, no doubt inserted this poem at the beginning in order to make a statement about the differences between human beings and animals. Whitman was himself something of a humanist and a universalist, his worldview (and presumably that of Burnford) on full display. The book is a tale of fiction about two dogs and a cat making their way home across the Canadian wilderness. It’s a fairly popular tale, having sold over three million copies according to the back cover. 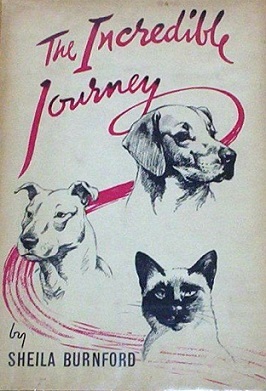 The 1993 film Homeward Bound was based upon it. That a popular children’s book could contain such a strong dose of humanism right before the opening chapter suggests that the vast majority of parents didn’t discern what their children were reading all of these years since it was originally published in 1961. But then again, a poet like Walt Whitman is just another figure in Americana, right? Kudos to our daughter for having that level of discernment at such a young age. It’s just another reminder to be careful about the books our kids consume, even (and perhaps especially) the ones which are considered classics.